Grow your business by developing apps that engage employees and extend your sales and service capabilities. Launch employee and customer apps 59% faster by enabling IT and business to work together. Give everyone the power to quickly and easily build any app on the Lightning Platform. Build apps easily with clicks or code. Run faster with pre-built apps and solutions. Create better apps by working collaboratively. Engage employees with apps that are instantly mobile. Boost user productivity by automating any process. Train more app builders with targeted learning. 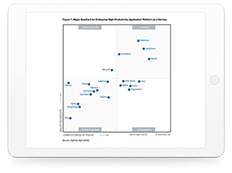 Gartner names Salesforce a leader in the Magic Quadrant for Enterprise High-Productivity Application Platform as a Service. America’s largest department store delivers a five-star customer experience. Biologists at PG&E build an innovative app to protect California wildlife. PwC helps clients transform employee experiences with an end-to-end HR app. 1,200 employees at Eating Recovery Center track patients at every level of care. Extend the capabilities of the Salesforce sales, service, and marketing apps you already use. Customize your CRM tools to fit every users' needs. Integrate customer data for a full 360-degree view. Spot hidden opportunities with analytics and AI. Elevate trust with advanced security services built in. Boost collaboration using tools shared with everyone. Easily scale up your apps for any number of users. Salesforce delivers better business and operational outcomes by serving as a scalable and agile application development platform. Want to know the difference between the Lightning Platform and the Salesforce Platform? See how we’re using our own platform to create custom apps, processes, and solutions. 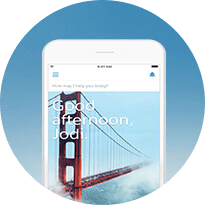 See how we built the IT Concierge app to reinvent the employee intranet. 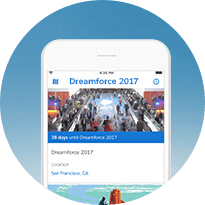 View our Events app, which elevates the mobile customer experience at Dreamforce. 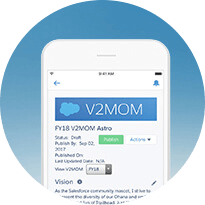 Explore how the V2MOM app built on Salesforce helps us align to achieve our objectives. Build custom apps and extend Salesforce for any business need. Extend sales, service, and marketing with custom apps. Digitize business processes for any department. Engage customers with apps on today's most innovative platform. See how to extend the world’s leading CRM platform with services and apps. Salesforce Platform is the app development platform that extends your CRM’s reach and functionality. You do not have to be a developer to build apps using Salesforce Platform. With drag-and-drop simplicity, just about anyone can create apps that automate business processes or help customers find important information. If you are a coder, Salesforce Platform is language agnostic, allowing fully customized application development in your preferred language. The apps you create for your business can be deployed on mobile, tablet and web, be simple or complex, and connect to nearly any data source. Start finding ways to enrich user experiences and streamline processes. Salesforce app development is only limited by your imagination. Community Forums: Allow community discussions with your customer base for them to help each other and have additional support. Marketing Automation Innovation: Be on the cutting edge of marketing technology with Pardot Marketing Automation. Enterprise Mobility Management: Platform provides everything you need for enterprise mobility management. Close Cases Faster: Close cases faster to keep customers happy with Salesforce Service Cloud Lightning.